Kind of a crazy game on Saturday. Very good win for the team, especially when it looked for a long stretch that it just wasn't Marquette's night. First of all, it's that pesky problem of being bad defensively on the road that pops up again. This was a problem all last year, and we're continuing to track it. However, the goofy thing about this game was that Marquette lost on three of the four factors and yet still managed to win the game. The defensive eFG% was outright, throw-your-remote-through-the-TV bad. 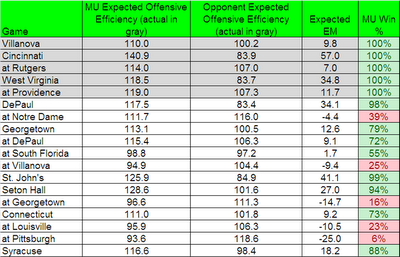 Despite the rash of early foul calls during the 1H, Marquette did not get to the line at a higher rate than Providence. And, Marquette allowed PC to get a higher offensive rebounding percentage. Nope, it was all about the turnover rate. Not only was Marquette able to force Providence into a higher turnover rate than predicted, but they were able to take care of the ball remarkably well. In the second half, Marquette had only three turnovers to PC's 13. Just as commentator Bob Valvano said, that was the key to the game right there. Despite all the giddyness (and deservedly so) from a big road comeback victory, is it time to start expecting to compete legitimately for the BE championship? Here are the current set of predictions for the rest of the season. With five games under the belt for most of the teams in the league, the set of data is starting to get better. However, it's still a reflection of how well the team is playing right now. Since they're playing well, that helps. If anything, I think the predictions for the home games against Syracuse and Georgetown are a bit high, and the matchups on the road for GU, UL and Pitt are a bit too low. However, it all passes the sanity check. Really, the big difference from the last time is that Marquette won two games (WVU and PC) that were considered "tougher" games. How do things look for the rest of the season? Start trying to figure out where Marquette will end up playing in the NCAA tournament. There is less than 1% chance the team ends up worse than 9-9, and 96% chance the team ends up with 10 wins or more. The most likely view is still that Marquette finishes with twelve wins, with a 70% chance that MU does better than last year's eleven wins. However, as the team is playing right now, there is basically a 50/50 chance the team has 13 wins or more at the end of the season. As a reminder, Georgetown won the league with 15 wins last year. UL and UConn were right behind at 14 and 13 wins, respectively. Everyone else bunched up at 11 wins after that, including Marquette. What are those odds? 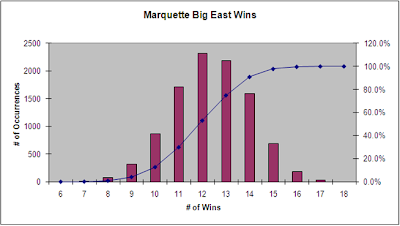 Is it too early to think that Marquette can compete for the Big East championship? Maybe, but it's definitely not a crazy notion anymore. This year's team is not only fun to watch and fun to root for, but they could be special. Pomeroy actually has us as a 1-point winner over Notre Dame after tonight's games. I think our ratings are just still too low because of how they crucify you for playing soft teams early - you'd really have to rub it in to get the point margins it would take in Pomeroy to have an impressive win against a cupcake. Hey JP. I don't use Pomeroy's prediction percentages. Those are my model percentages. The storm is still on the horizon. While I am wildly rooting for Marquette to take the BEAST, I know Syracuse, Georgetown, Louisville, Pitt, Notre Dame, UCONN have other ideas. Frankly, this was a win that a mature, senior team needed to have. Yes, Providence College was better than perhaps we expected, but that's no excuse. Had they lost to Providence, I would have had severe doubts about this team. I have moderate doubts, even today, but at least they win what they're supposed to win. Now for the "fun" part of the schedule. Buzz -- keep 'em moving. Xavier Mania! .. Plus a great video..
MU down 13, storms back to beat Providence by 9. Weekly Videos: Coobie Nails a 3!